Chris decided to make her home-made flat bread pizza. It’s been many months. Am I guessing since early last summer? Chris considers the flatbread pizza a healthy option. The pizza was made with caramelized onion, chicken, pesto, sun-dried tomatoes, and green pepper with mozzarella. With the pizza, I wanted to pair it with a nice bottle of wine. Would it be an Italian or French? California wine? I was wanting something different and it’s been a long time since I had a glass of Malbec. Over the years, I have drunk Malbec wines and I feel the ones from Argentina are probably the best. 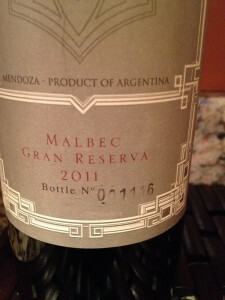 Having decided on Malbec as the varietal I knew I wanted to try the 2011 Famiglia Meschini Gran Reserva Malbec. Last Friday the local liquor store had two wine tastings. The one I was interested in was from Famiglia Meschini. 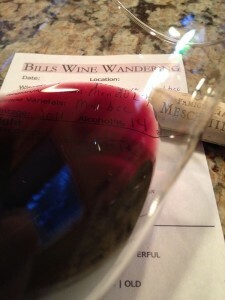 At the tasting, we were able to try many of the varietals they offer. We enjoyed many of the wines and Chris wanted to purchase a couple of the 2011 Gran Reserva Malbec. You will notice the bottle is numbered. I asked Teresa Meschini why. I was not sure if it was related to customs or something else. What Teresa told me was the following: “We number the bottles because we like numbered bottles. We are a boutique wine label and like people to know that. Also, Eugenio collects the bottle numbered one of each vintage.” I have to admit I like that! It makes the bottle a little more personable. Deep color depth with a nice garnet hue. The Malbec was very clear. The Malbec aroma was moderate and fruity. I could smell spice, oak, and blackberry. The Malbec was dry and full-bodied. The acidity was slightly tart. The tannins medium and slightly astringent. My first sip made my lips slightly pucker. I could taste dark chocolate with a slight green pepper finish. The Malbec has good structure. The finish was long and flavorful. How much: $24.99 at a local liquor store. Chris and I really enjoyed the Gran Reserva Malbec. 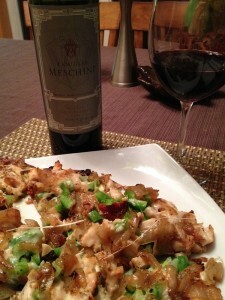 The Malbec paired very well with the home-made pizza. 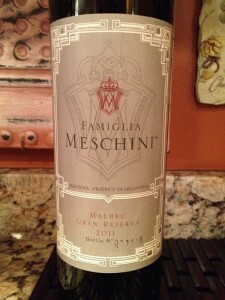 I rated the 2011 Famiglia Meschini Gran Reserva Malbec three glasses. I can see this wine will cellar for a few years and I suspect the flavors will enhance more.